I cannot remember where I first heard about this book. I skim about 15 blogs a day and have Twitter and Facebook friends who post cool items all the time, so it is escaping me as to where I first learned about this book. And I am pretty sad about that because I feel an overwhelming urge to thank that person. Maybe it was here, or here, or here. Nonetheless, God, through Mrs. Butterfield and through that recommendation, truly blessed me. Greatly. Immensely. Amazingly. Rosaria, by the standards of many, was living a very good life. She had a tenured position at a large university in a field for which she cared deeply. She owned two homes with her partner, in which they provided hospitality to students and activists that were looking to make a difference in the world. There, her partner rehabilitated abandoned and abused dogs. In the community, Rosaria was involved in volunteer work. At the university, she was a respected advisor of students and her department's curriculum. 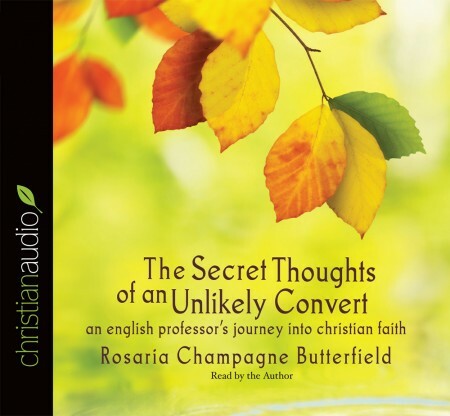 And then, in her late 30s, Rosaria encountered something that turned her world upside down-the idea that Christianity, a religion that she had regarded as problematic and sometimes downright damaging, might be right about who God was, an idea that flew in the face of the people and causes that she most loved. What follows is a story of what she describes as a "train wreck" at the hand of the supernatural. These are her secret thoughts about those events, written as only a reflective English professor could. This book is encouraging and moving. It is startling in its honesty and its perspective. This book is a quote machine but it does not sacrifice substance for pith. It addresses a wide range of contemporary issues, not the least of which is how God moved her from Lesbianism and, even more importantly, a post modern skepticism that had left her disillusioned with the central truth claims of Biblical Christianity. The story of her conversion is messy, sad, encouraging and exciting. It is brilliantly written and greatly God-honoring. I did have a solitary problem with the book. I was concerned with, and put off at times with, how the Regulative Principle of worship was handled. Two issues concerned me. First, the Regulative Principle was presented as the only viable, Biblical approach to Christian worship and that it was definitely the only one that faithfully lived out Sola Scriptura. Secondly, and much more of an issue, was the fact that I was bewildered to see such an extensive discussion on this topic in this text. I feel it does a disservice to the book and will cause many who take up reading it to put it down and not return. I, personally, love reading about topics such as this and I was still tempted to abandon it because of the time spent on the topic and the manner in which it was approached. Which is sad. The remaining pages are filled with Gospel-drenched counsel, encouraging stories and a call to reach the unloved unlike any I have ever seen. It encouraged me to continue in the path God has placed before me and my family and challenged me in how I reach out to the hurting and the unloved. I praise God that I pressed through on the Regulative Principle pages and saw the gold awaiting me at the end of this book. Doug Wilson, on his blog, noted something special about the book. ...while the book is relatively short, it is jammed with passing observations that are priceless. She is a wise woman with a good eye. Not only does she have a good eye, she has a trained outsider's eye. She was converted out of the world, and grafted into Christ. Her description of that is glorious. But she was also converted out of one tribe, and grafted into another tribe, a reality which gave her a good perspective on which aspects of our behavior (in the conservative Reformed world) were about Jesus, and which ones were merely tribal . . . and kind of odd. Consequently, there are observational gems throughout the book, usually just a sentence or two, but which could be developed into chapters or books all on their own. Pay attention to those. I cannot think of a better endorsement than the fact that I have already gifted a copy of this book. And, though my "To Be Read" list is immense(and ridiculously impossible, to be honest), I will read this book again. It is that good. To quote Doug Wilson, "Gosh, what a book." I cannot recommend this book highly enough. I do not agree with everything she says; but I did learn from everything she wrote. It deserves the widest possible readership.